This was an interesting piece of art work. I say art work because I was a liberal arts minor in college. I also studied music from the time I was 10 years old up through my first 2 year if college. So, I found myself reminiscing while reading your foundation, as well as the poem. Thank you for taking me back to a time I am very fond of. Thanks for the visit, Greer, and for your kind words. Please come again…. This post impacted me in a peculiar way. As I followed tour discourse I was taken back to my youth. I played the bass violin in the youth symphony orchestra at the age of 10. So, as I continued reading I began to feel sort of melancholy. I enjoyed that period in my life because playing a stringed instrument was quite an accomplishment, or at least I felt it was. I did appreciate the fact that you committed to explaining the meaning of the poem for those of us who were not familiar with the language and the fact that you kept your word and at the end you provided insight. Nice work! I’m glad the poem had meaning for you. You’re right…playing the bass violin when you were ten was quite an accomplishment. I bet all of your talented young friends had a grand time with it. What’s interesting for me is that this poem took you back to your youth…that, even though picking pineapple was not a familiar experience you were still able to connect with it. Thanks for the visit and for sharing your thoughts. Please come again…. O wow!! I find it rather very educational. I never knew Hawaiians had their own language. Now I know. The Youtube insert was perfectly done and drove home the point. 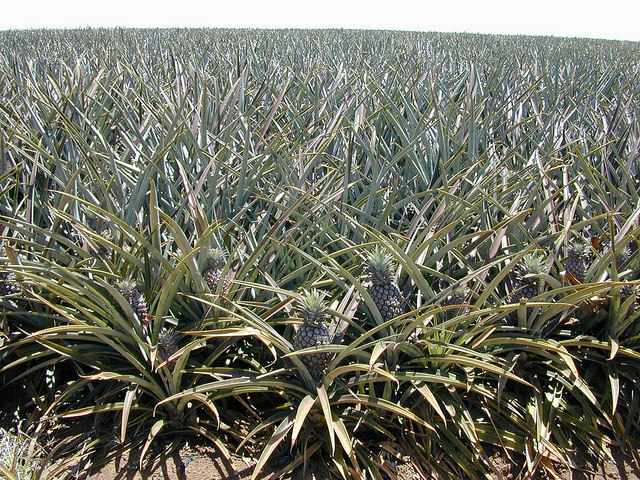 The pic of the pineapple plantation opening the page heightens anticipation of what might this post is about. I think it is well presented. I grew up in west Africa and around plantations and old form workers. This post reminds me of my youthful days back home. The only thing missing was that I did not hear you sing a song from the poem you wrote. Thanks for the visit Odikro. It made me laugh. I don’t think my singing would add to the thing! Hee! Please come again…. This site has been built with a lot of passion for poetry as the contents of the site speaks it all. Really got carried away going through the pages as it is very unique in the way the feelings of the poet is expressed. The layout of the site, the color choice and the related pictures all blend in well and is very classic. Navigating through the pages was easy without any hitches.The relevant videos put together gives this site that added touch of depth in the subject. It will be a very interesting site for poetry lovers to explore, learn and enjoy.It is well presented. Achuthan, thank you. Please come visit again…. Leon, thank you for the visit and for sharing your thoughts. I do appreciate it. The poem is very artistic stuff. It is hard to see poems in this generation, but also we know a great song is just like a poem. You will find the meaning and walk with you through the low tide or get inspired. The song is like modern day poem, but of course, sometimes the simple way is to listen about a poem. After all, a poem is like a great song, and poem is the most original song! Yu-siang Lin, thank you for your visit and for sharing your thoughts. I love your phrase, “You will find the meaning and walk with you through the low tide or get inspired.” It really does work like that. Where I come, there is not excuse for failure and I took that to heart. It became my song and hence my repeating poem. I ended up taking to poetry in my leisure time , but this time around I write only about life , death and love. Maybe because I was exposed to many unforgettable and unpleasant experiences and at a young age. Olalekan, I do thank you for the visit and for sharing your story. You are right. Your exposure to hardships at a young age has probably affected the poems you write. This is a good thing. Perhaps you can make them into a way to express yourself and your heart. Perhaps they will help other people find their own way through their troubles, as I am sure you are trying to do. I quite enjoyed this piece of art. I always like reading people’s art work because it’s a doorway into the mind of the writer, and subsequently, an avenue to see a different culture. In my community, we speak some language we call pidgin English. I never knew Hawaii has a language like this too. Keep up the passion, I love your art. Thanks for the visit and for sharing your thoughts, Louis. I think every place that has seen an influx of immigrants has some sort of pidgin. When the sugar and pineapple plantations were the biggest economic forces on the islands, the plantation owners experimented with importing field workers from different parts of the world. Everybody had to figure out a way to talk to each other. Our Hawaiian-style local pidgin is still going strong and continues to evolve (despite the efforts of standard-English educators who do try to discourage its use). Through the most beautiful ways I could express it even if sour than lime. Thanks for the visit, Ayodeji, and for your poem. Cool!